SEO is one of the biggest mysteries to many bloggers, but it's also one of the most important concepts to master to improve traffic to your blog. The good news is, SEO, or Search Engine Optimization, doesn't have be scary. I've got 10 quick & easy ways to improve your SEO so you get found in search. If you need a quick overview of what SEO is and why it's important for your blog, you're going to want to push pause and go read THIS POST. Then come back here when you're ready. Now, I'm not going to promise that you'll end up on the first page of Google search overnight, but implementing some or all of these quick SEO tips will improve your placement on search engines over time. Before you type the first word of a blog post, you need to know what your keywords will be for that post. Take some time to do a little research to determine what people are searching for that might land them on your blog. Ideally, you want that number to be green, and the higher the score, the better the headline. While this doesn't weigh the searchability of your keyword, it will help you write a solid headline that includes your main keyword. If you might notice, the very first word in this blog post is "SEO", as that is the main subject of this post. If it doesn't make grammatical sense to have your main keyword as the first sentence, at the very least, make sure it's in the first paragraph. BONUS: Make it bold. It tells search bots that those words are more important than the words around it. When you create a blog post, by default, you are given a URL that goes with it. Every word of your blog post title will appear in the URL, but you can change it, and in most cases, you should. Remove stop words, like "the", "and", etc. Anchor text is any text that is linked to another website. A lot of times, we'll put "Click Here" and link those words to a related blog post, but that does nothing for our Google juice. Instead, use keywords and form an actual sentence, linking the entire sentence to your related blog post. BONUS: Make it a do-follow link to your own content so search bots have a path to follow. Heading tags are H1, H2, H3, and so on, and they are read by search bots and can help boost your SEO ranking if used properly. Your main keyword should be used in an H1 tag towards the beginning of your blog post. This can be a rewording of your blog post title, to make it easy. Use secondary & tertiary keywords in your H2 and H3 tags throughout your post. Only use an H1 tag one time per post. It's the most important text and search bots will see it as such. The highlighted portion up there is an image as seen by search bots. If you don't name your images, they'll read something like "DSC_0014" instead of "The Beginner's Guide to SEO for Bloggers". Now, which one of those image names will help improve your SEO? HOW TO: After editing your images, name them according to your blog post, using keywords, BEFORE uploading to your media library. This basically gives you a bonus entry in the SEO competition. Personally, this is where I type what will appear as my Pinterest description. I pack that bad boy full of relevant keywords and keyword phrases because, not only can search bots read it on my blog, they can read it on Pinterest, too! Your meta description is what tells people who see your post in search what it's about, enticing them to click over. If you don't write a meta description, by default, the first few lines of your post will appear. YOAST SEO PLUG-IN DOES NOT "DO" SEO FOR YOU. It's simply a guide, a sort of SEO checklist built into your blog. So don't install it and expect your SEO to magically improve. You have to use it, and use it properly. 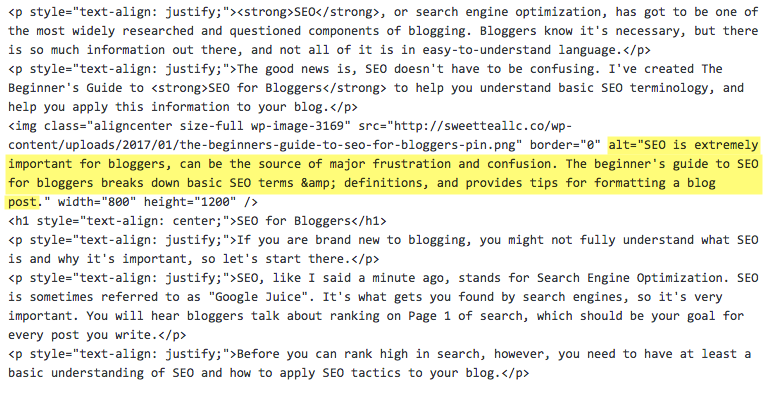 So, Yoast sits at the bottom of the text editor section of every blog post and page, and you can basically use those little green dots as your virtual SEO checklist. TIP: To use it effectively, you need to set the main keyword for your post first. GET "10 WAYS TO BOOST SEO LIKE A BOSS" FOR FREE INSIDE OUR RESOURCE LIBRARY! Ep. 023: Should I Take This Course?